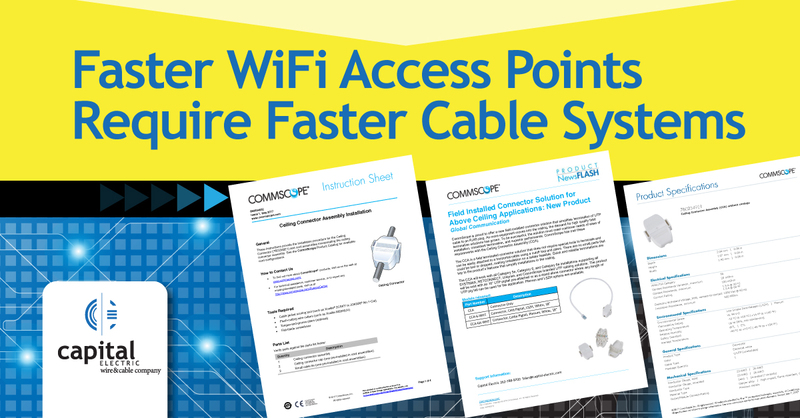 Due to higher bandwidth and the increased power requirements of the latest wireless access points (802.11ac), industry best practices recommend that Cat 6A cable systems are installed to support WiFi AP (access point) connections. It’s bigger and the copper conductors have been enlarged to handle more power. The twists in each pair have been tightened to reduce the cross-talk at higher frequencies. Many manufacturers make the jacket’s outside diameter a bit larger to help isolate alien cross-talk (eliminating cable A from crossing over to cable B). These changes also help Cat 6A cable systems handle DC power more efficiently than smaller cables, resulting in more mass handles and power with lower loss and cooler temperatures.